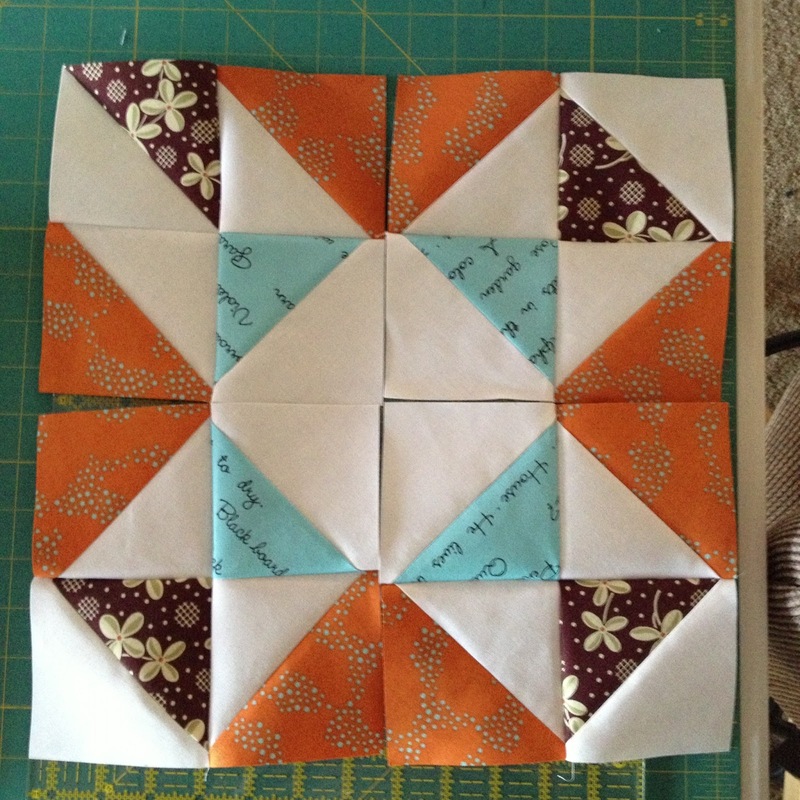 It seems Half-Square Trianlges are my method of choice, lately, when it comes to quilt blocks. First up is Jeni's In Color Order November block of the month. It helps to pay attention to what you are doing. Luckily, I caught this mistake before I had completely finished sewing this block together. A quick un-picking and it was fixed. One more month to go and all 12 blocks will be finished. Cindy Fluffy Sheep Quilting wanted Depression Blocks for her month as queen in the Modern Stitching Bee. 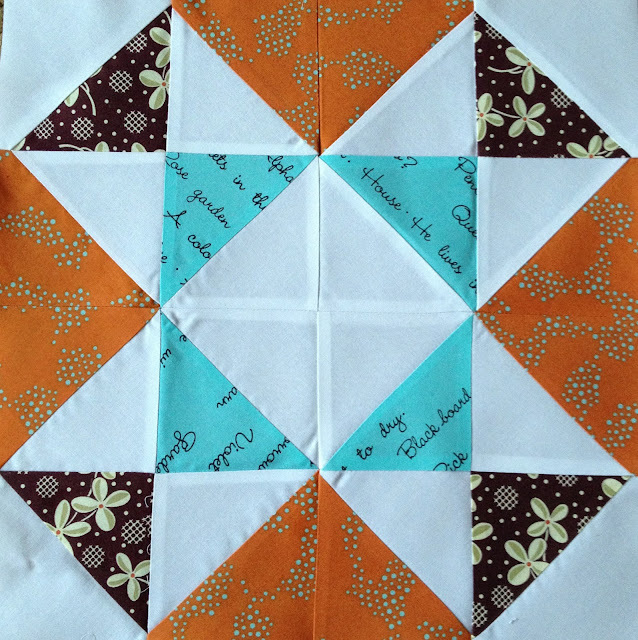 So scrappy, half-square triangles were put together and sent off to Ireland. Jennifer Knotted Thread is collecting blocks to make quilts for families affected by Hurricane Sandy. I sent these off to her this week. There are so many ways to arrange HST. I'm also putting together one of the quilts for Jennifer's Hurricane Sandy families. Rachel, who blogs at Suz Made Me Do It, volunteered to make 10 blocks. When I found out she lives near me we agreed to meet in person. She didn't make 10 blocks, she made 20! And she also donated enough fabric to back the quilt I am making. I really enjoyed talking with Rachel. We not only talked about sewing but also our families and husbands, politics and travel. I mentioned to Rachel that my favorite seam ripper is bent and I cannot find another one like it. Well, today she emailed me. She found what I have been looking for on the internet. I ordered three. I'm also working on another HST project with these fabrics. But, that's enough for today. I'll save the rest for another day. Your blocks are all so lovely! Brilliant blocks for everyone. You must be able to trim HSTs at speed! Love all your blocks and the fabrics! You have quite a talent for putting colors together! HSTs are fab but you do need to pay attention - sometimes tricky for a flutterbrain like me. Beautiful blocks and so lovely to meet someone wonderful! Love the fabrics in the last photo! And HST take an awful lot of trimming...but I think you already know that! Great looking blocks but no surprise there. Something else not too surprising is that I am mosey and want to what seam ripper is so good you would order three? Art Gallery fabrics. They are so nice to work with. It must be the season, I was doing HSTs too in another bee. I do love them and your blocks are beautiful. Love the HST season? LOL, it may not actually be the season, but it sure feels like it! It was fabulous meeting you!